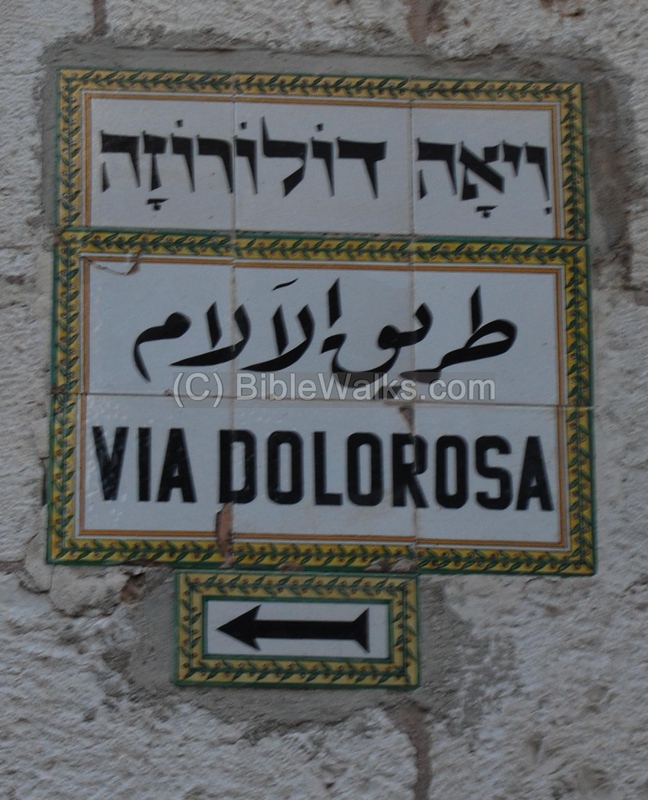 Via Dolorosa ("Way of Grief" in Latin) is a road in the old city of Jerusalem, a path where Jesus was lead in agony, carrying the crucifixion cross. There are a total of 14 stations along this path. Luke 23, 26: "And as they led him away..."
Via Dolorosa ("Way of Grief" in Latin) is a road in the old city of Jerusalem, a path where Jesus was lead in agony, carrying the crucifixion cross. 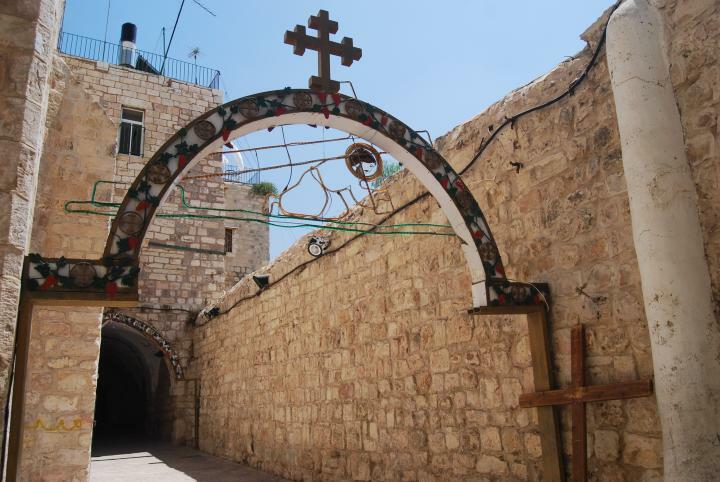 There are a total of 14 stations along this path, based on events that occurred on the way to the Golgotha hill, the site of crucifixion, which is located at the Church of the Holy Sepulcher. 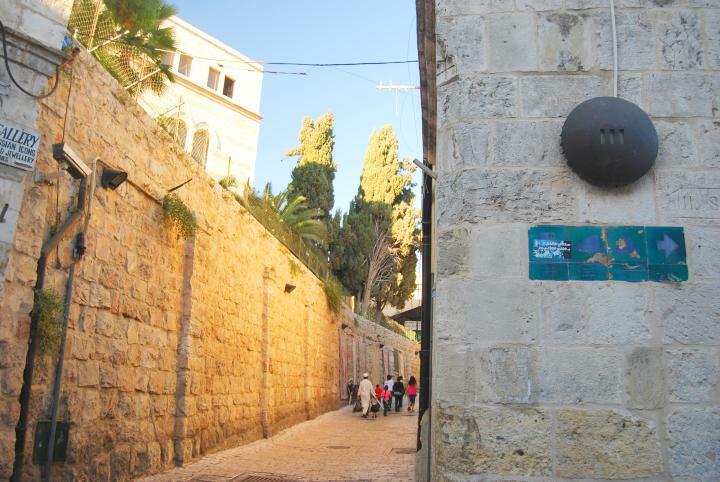 Eight stations are marked along the old city road, while 6 additional stations are places in the compound of the church. 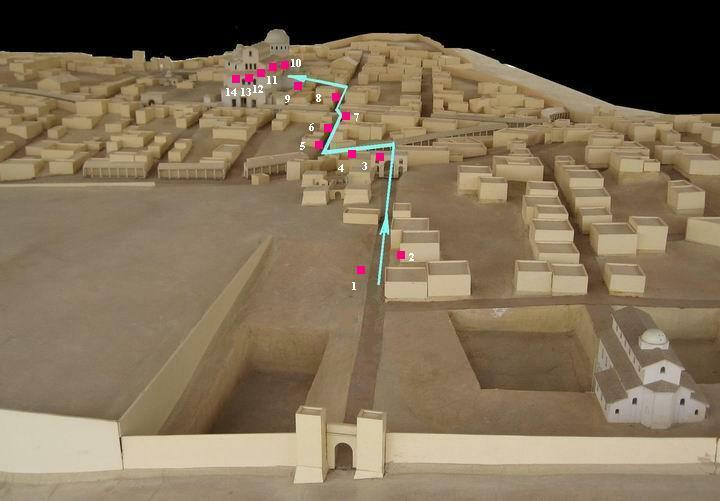 The path is shown (in a bright blue line) on the model of the Byzantine city (displayed at St Peter Gallicantu church), with indication of the 14 stations. You can point and click on a purple point to navigate to the selected station. The photos are arranged in the order of the stations. 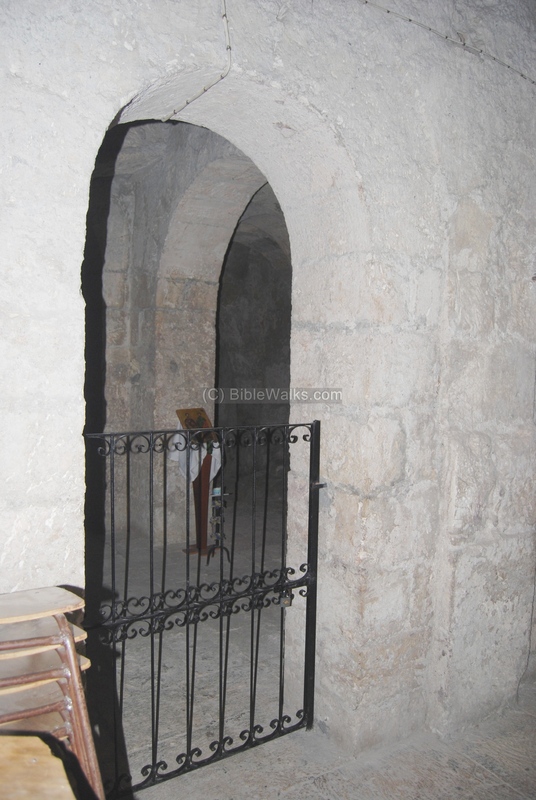 The 60+ photos shown below are a sample of the many sites along the Via Dolorosa path. 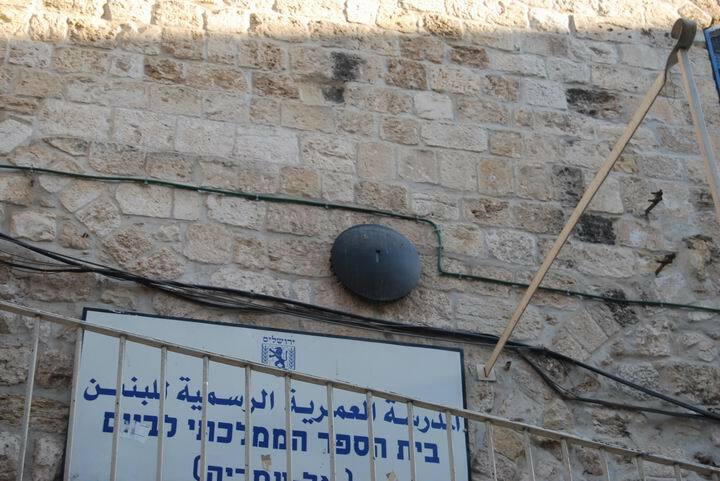 Station 1 is located on the north-west corner of the temple mount, across the street from the Franciscan convent of the Flagellation (station 2). This is the present position of a the Al-Omariya school, as seen in the photo below with the round sign "I" (which is "1" in Roman numerals). The site was in the Roman times the place of the seat of Pontius Pilate, located in the Antonia fortress, and the place of the hall of judgment. John 18-28: "Then led they Jesus from Caiaphas unto the hall of judgment". Jesus is condemned to death by Pontius Pilate, as per John 19:16: "Then delivered he him therefore unto them to be crucified". The school's yard is seen below. In the background is the grey dome of the Notre Dame de Sion Ecce Homo, a convent which is located along Via Dolorosa. 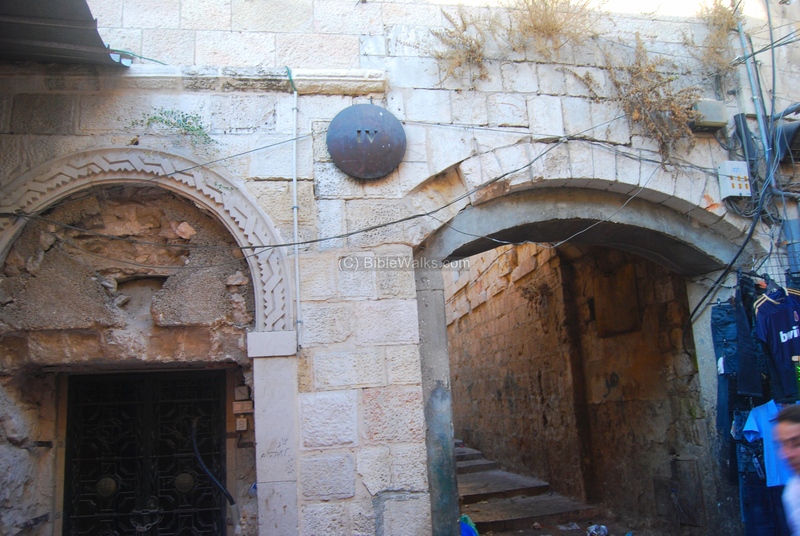 This place, once the Antonia fortress, is located exactly north of the temple mount. 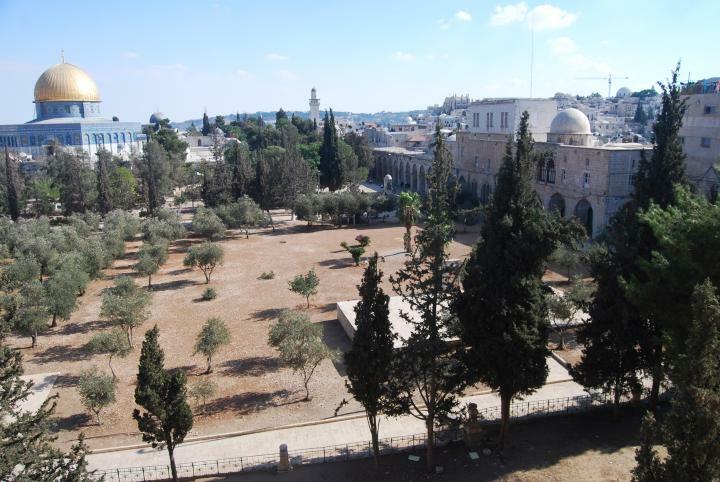 The photo below shows the view from the school's yard, with the Golden dome of the rock on the left. 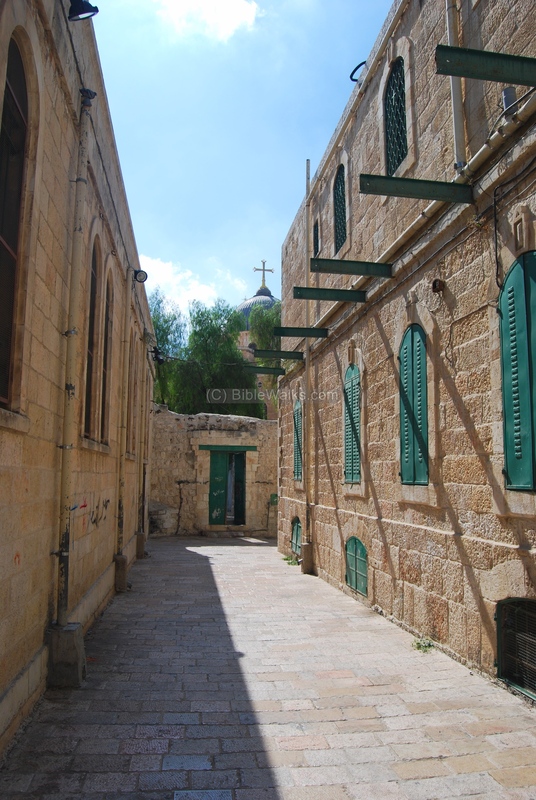 The photo below shows a view of the first section of the Via Dolorosa road, looking towards Mount of Olives (seen in the far background). 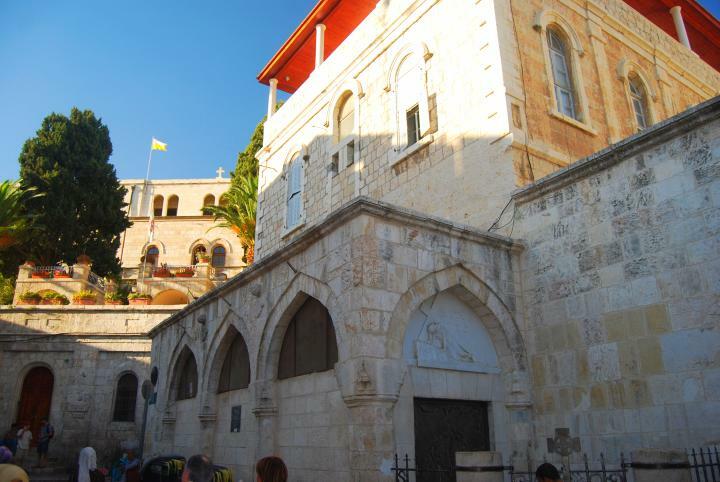 Mount of Olives is accessible through the Lions' (St. Stephen's) gate which is located at the edge of this road. Along the left side are the walls of the Franciscan monastery. 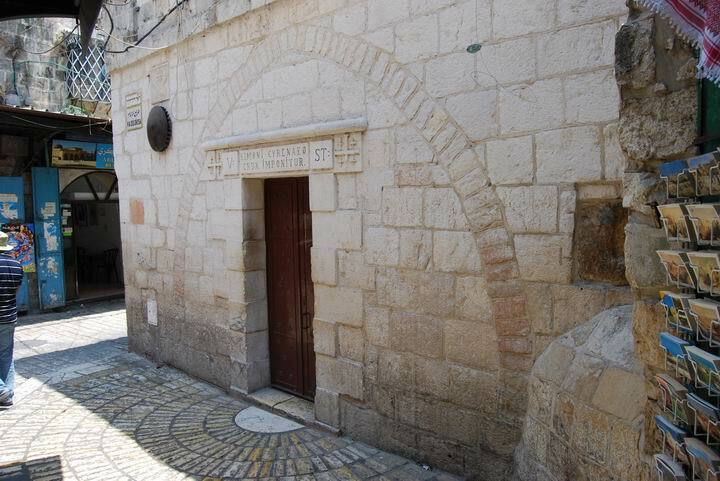 The second station is located near the compound of the Franciscan monastery, across the street from the first station. It is seen below, behind the sign with the station number "II". 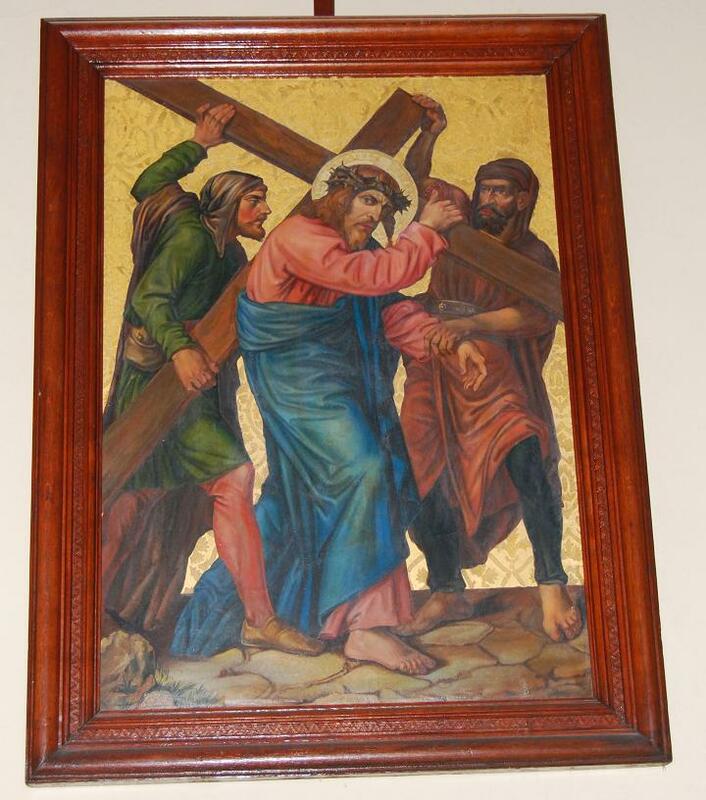 At this station Jesus receives the cross (John 19:17, 19): "And he bearing his cross went forth into a place called the place of a skull, which is called in the Hebrew Golgotha...And Pilate wrote a title, and put it on the cross...". 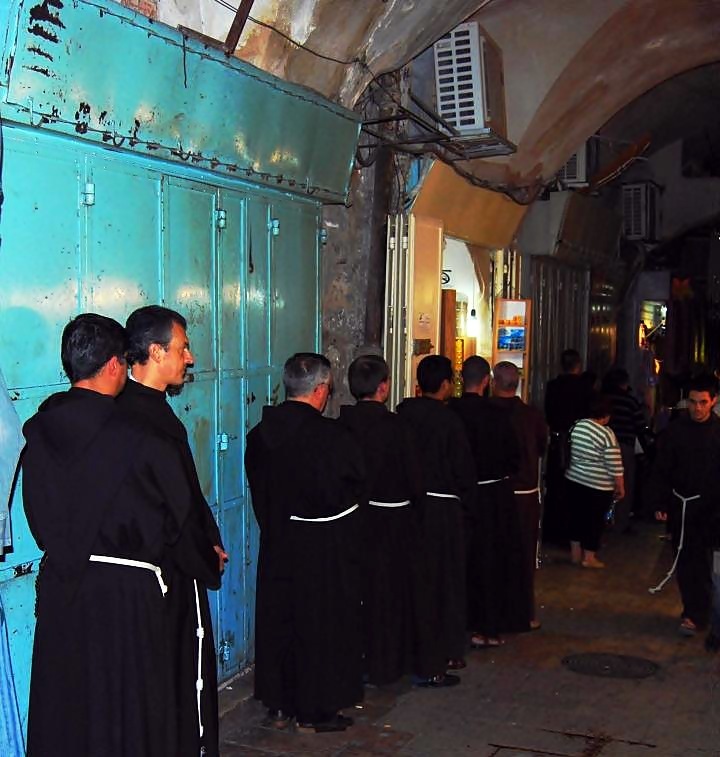 In the Franciscan compound are two churches - the Flagellation and the Condemnation. 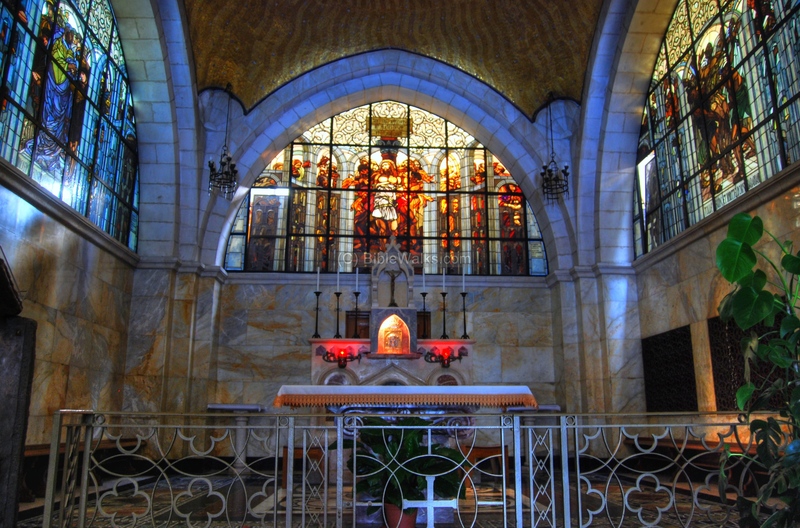 This photo below shows a view of the interior of the Flagellation church, with 3 remarkable stained-glass windows illustrating Pontius Pilate washing his hands from the sin (on the left); flogging Jesus and placing a crown of thorns over the head (center); and Barrabbas rejoices on his release instead of Jesus (on the right). "Then Pilate therefore took Jesus, and scourged him. And the soldiers platted a crown of thorns, and put it on his head, and they put on him a purple robe, And said, Hail, King of the Jews! and they smote him with their hands". 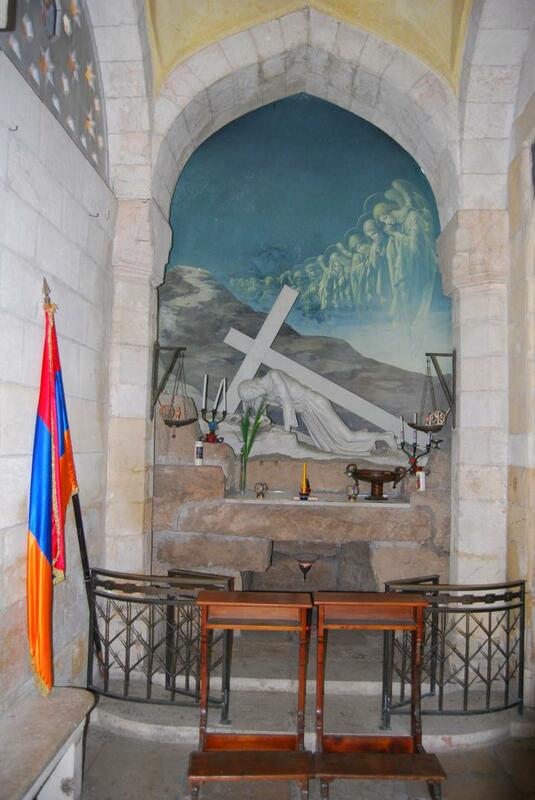 The altar of the adjacent church of Condemnation is seen below. 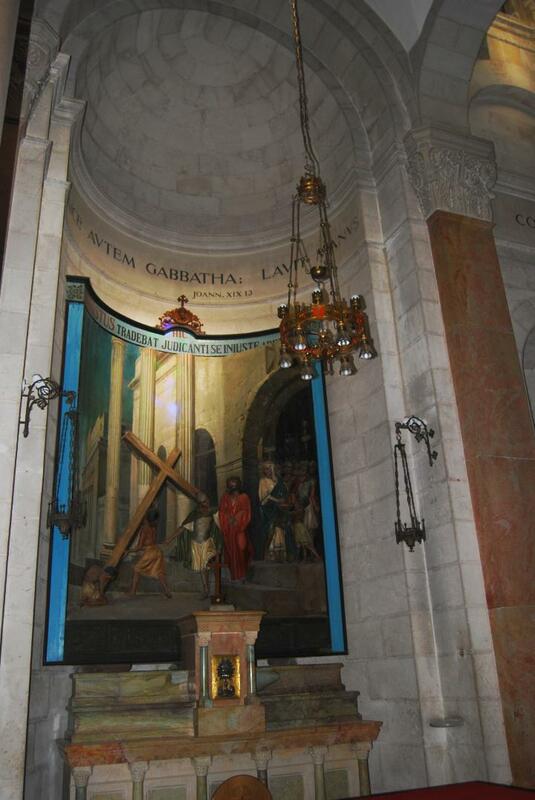 According to tradition, this was the site where Jesus took up his cross after being sentenced. For more information, check the sites of the churches of the Flagellation and the Condemnation. Between Station 2 and Station 3 are other interesting sites. The central opening of the arch of Ecce Homo (Latin for "behold the man"), seen below, is part of an Early Roman arch which had triple openings. Built as a triumphal arch in 135 AD, in honor of the visit of Emperor Hadrian, this was part of the Antonia fortress. 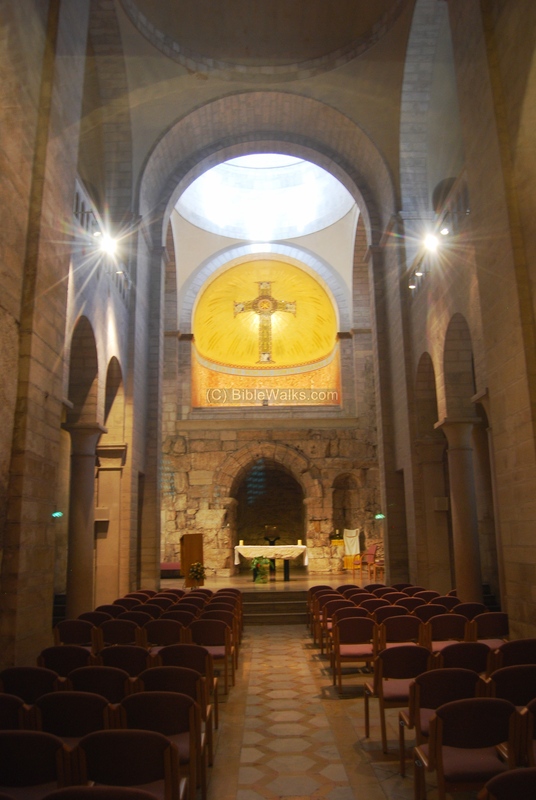 The northern opening of the Ecce Homo arch is embedded in the Ecce Homo basilica (dated 1868). This well preserved section is seen in the center of the photo below. 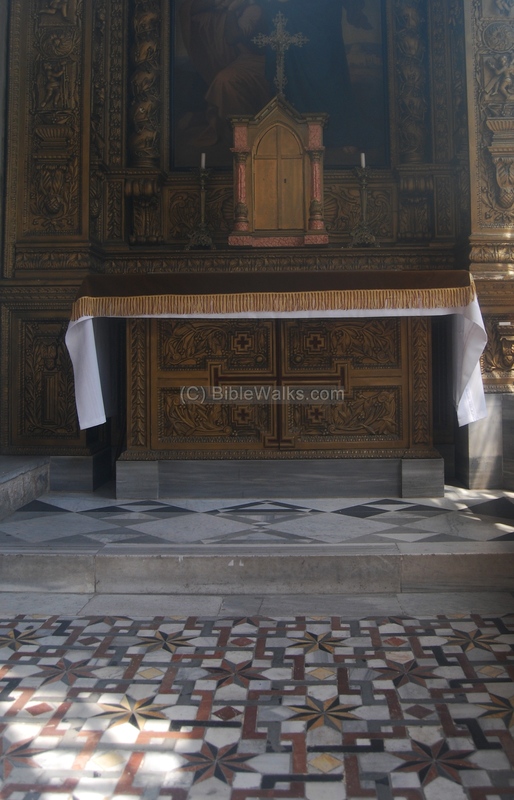 According to tradition, this is the site Pilate presented Jesus to the crowds (John 19 5): "Then came Jesus forth, wearing the crown of thorns, and the purple robe. And Pilate saith unto them, Behold the man!". This station is located on the corner of via Dolorosa and El Wad (Hagai) street, which is seen in the photo below. 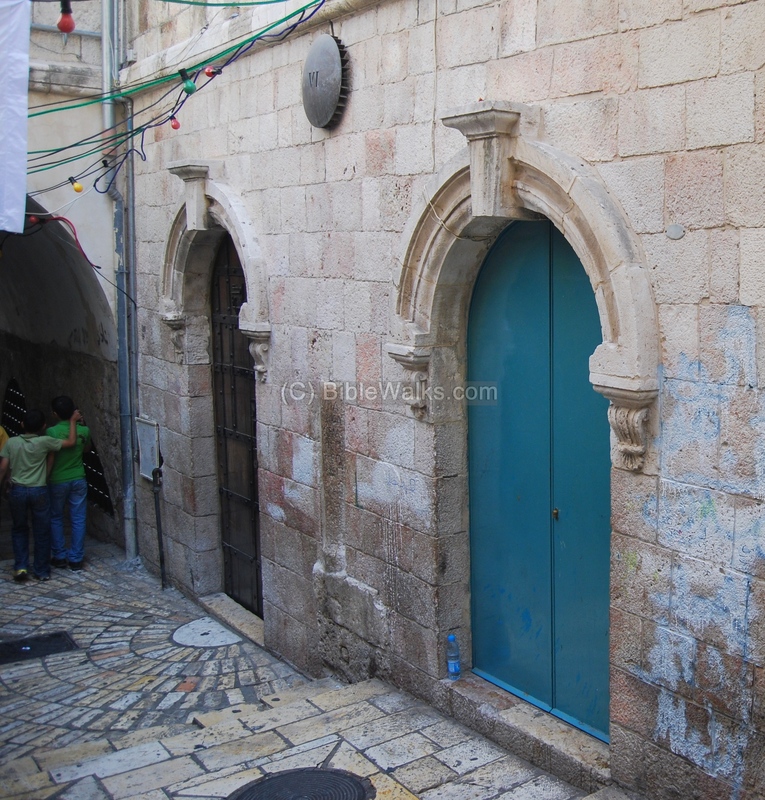 At this point Via Dolorosa makes a sharp turn to the south-east, following the direction of the western side of the temple mount, until it turns again westwards at the fifth station. At station 3 Jesus falls for the first time under the weight of the cross that he is carrying. 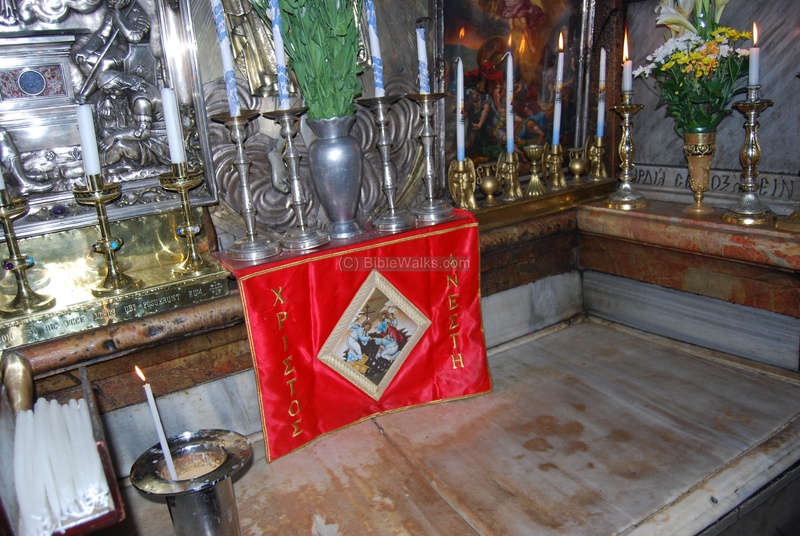 A stone tablet can be seen in the center of the photo below, with Jesus fallen on the floor under the cross. At this site is the Polish church, seen below on the right side. The Austro-Hungarian hospice, which serves as a hospital, is seen on the left background. The entrance to the chapel of the third station is seen in detail in the photo below. 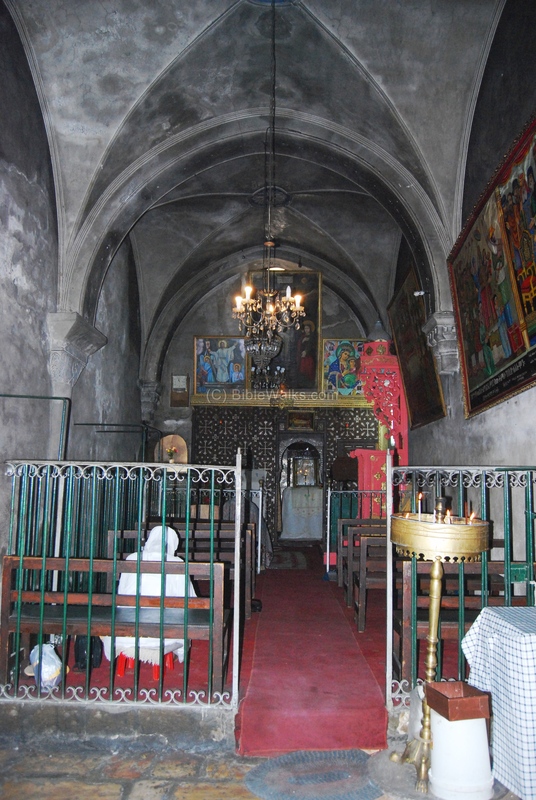 This small chapel was built during the 15th century by the Armenian Catholic church. In 1947-48 it was renovated with the financial assistance of the Polish army. The hall in the entrance of the chapel is seen below. The painting on the wall shows Jesus falling under the weight of the cross, with the angels watching and praying. 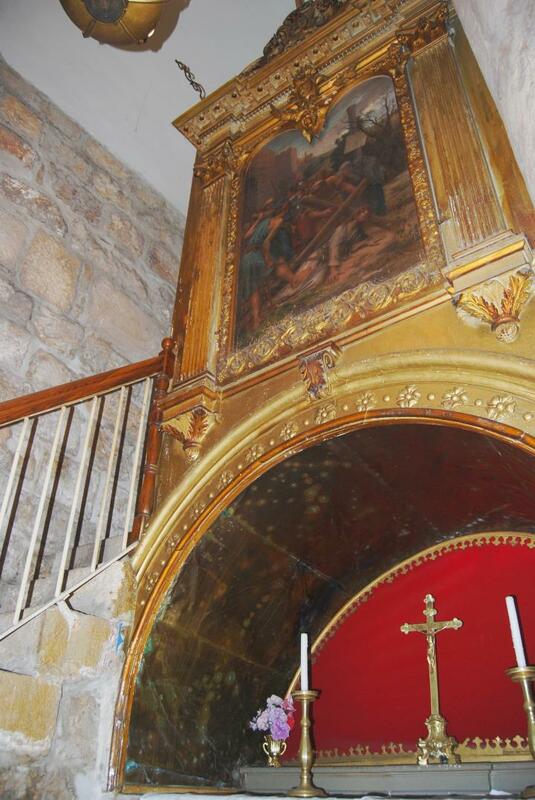 From the entrance you pass through a gift shop, climb down the staircase, and reach the chapel of the 3rd station. 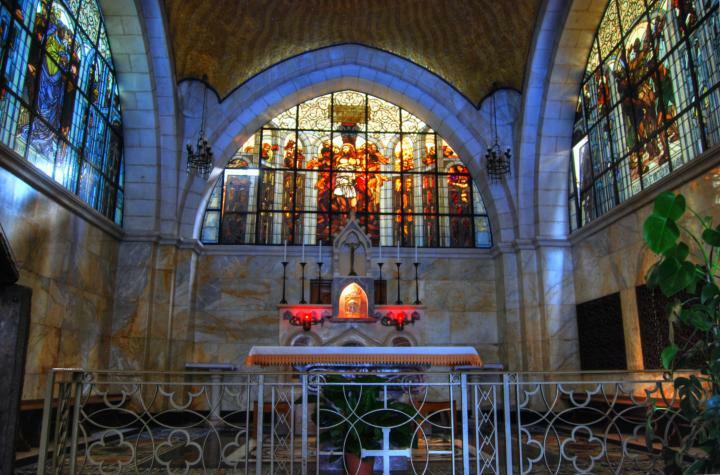 The chapel is actually located in the crypt of the Polish Catholic church, seen below. Another painting is seen below. This 4th station is located very close to station 3, further south on El-Wad (Hagai) street. Here, Jesus met his mother Mary according to the tradition. An Armenian church ("Armenian Church of Our Lady of the Spasm") is located behind the walls of this site. As per John 19, 26: "When Jesus therefore saw his mother, and the disciple standing by, whom he loved, he saith unto his mother, Woman, behold thy son!". It is interesting to see a short section of the Roman/Byzantine street between the 3rd and 4th stations. 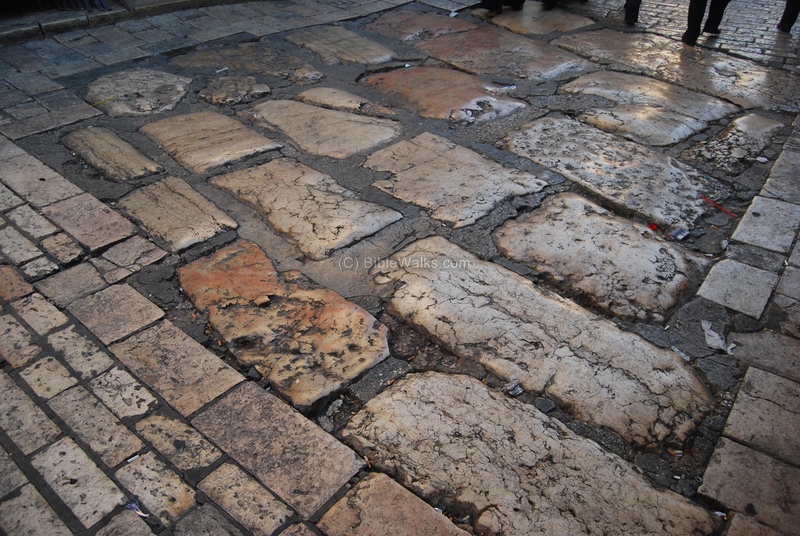 This pavement was probably part of the "secondary" Cardo, which once connected the Damascus (Shchem) gate to the Dung (Ha-Ashpot) gate in the south, as seen in the Madaba map. 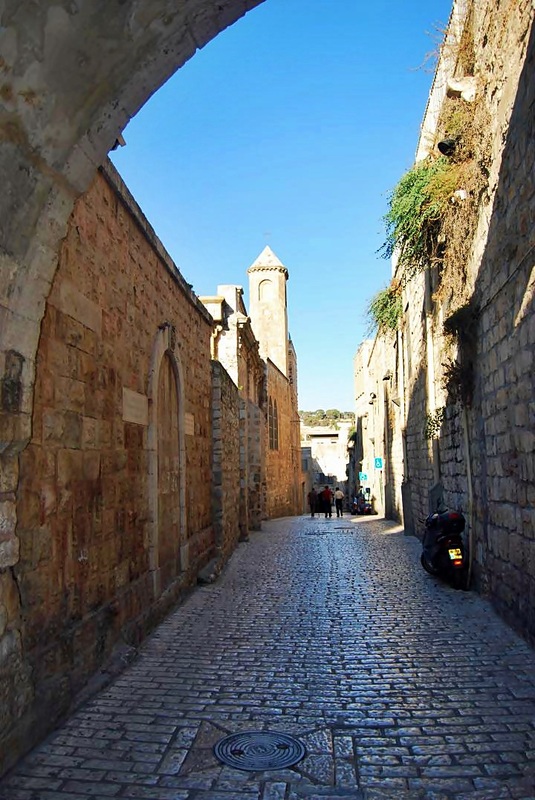 Although the stones were paved several hundred years later, they followed the same route of the Roman street that existed during the times of Jesus. The may have been part of the Roman street, so conceivably Jesus could have walked on the stones(1). 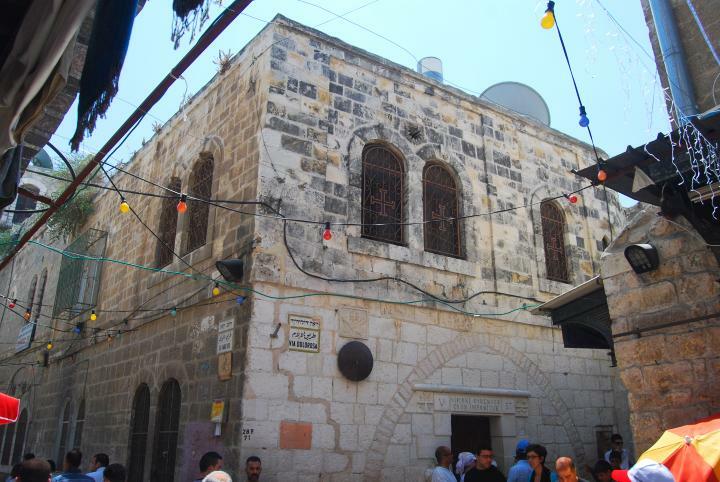 The 5th station is located at the corner of Via Dolorosa road and El-Wad ("The Gai") road. At this corner the road turns sharply to the right, and then starts climbing up the hill with a series of stairs. 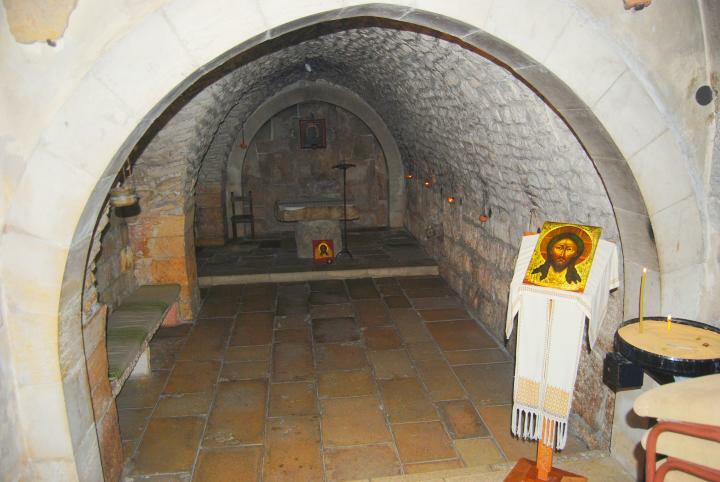 A small Franciscan church is located at this station, dedicated to Simon the Cyrenian, who assisted Jesus with the cross. This is based on Luke 23, 26: "And as they led him away, they laid hold upon one Simon, a Cyrenian, coming out of the country, and on him they laid the cross, that he might bear it after Jesus". Note that Cyrenia is located in modern Lybia. This small chapel was established in 1229 - the Franciscan's first site in Jerusalem. 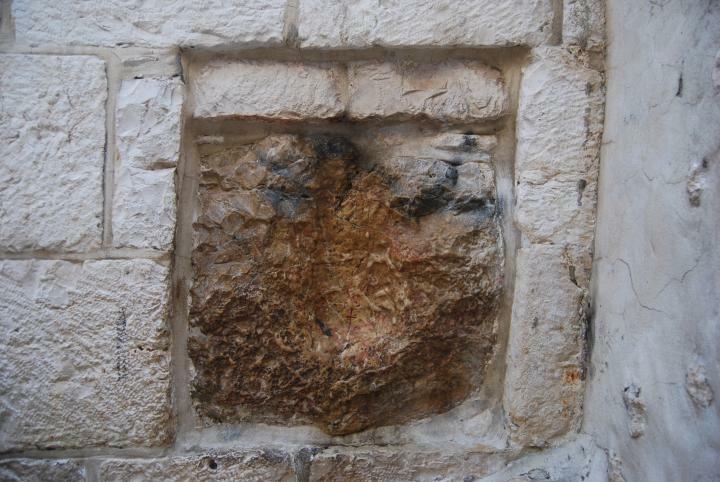 An old square stone, located on the right side of the structure, has a cavity which is said to be the imprint of Jesus hand. 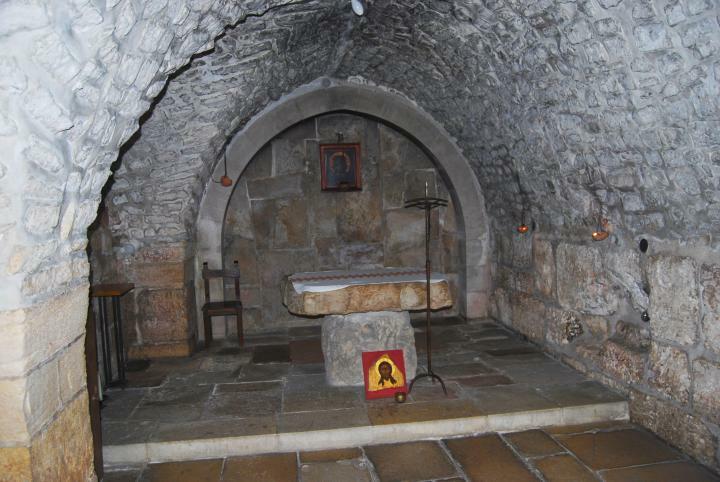 Station 6 is further west up the hill, and is dedicated to the woman (St. Veronica) who wiped Jesus face. This is based on Luke 23, 27: "And there followed him a great company of people, and of women, which also bewailed and lamented him". Her name, Veronica, may have been based on the Latin words "Vera"+"Icon", or "true image" - the face of Jesus on the woman's handkerchief. A small Greek Catholic chapel is located at this station. 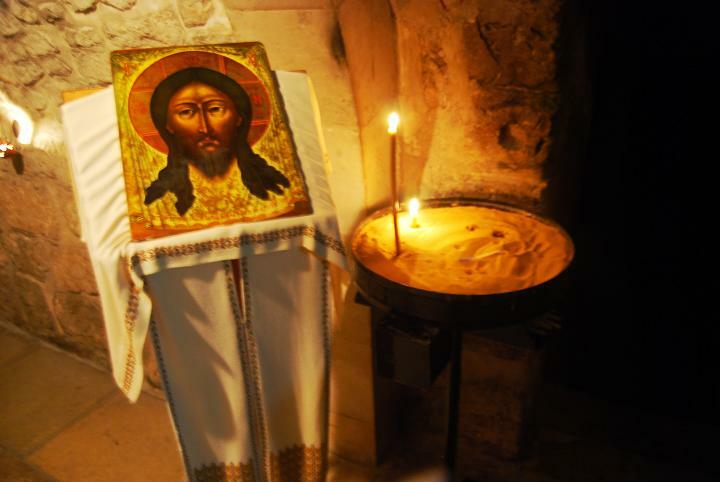 It is named "The Holy Face", since Veronica wiped Jesus face with a silk veil. The front door, located on the left is usually closed. 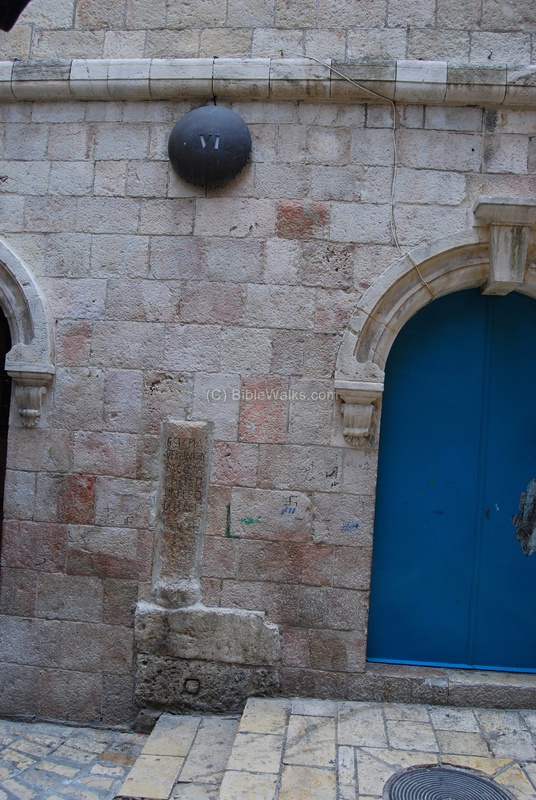 Behind the right blue door is a little shop of the Little Sisters of Jesus, who sell icons. On the old stone pillar, seen between the two blue doors, is an inscription with the station's name. After entering the right door, and turning left, you stand at the end of a long chamber, as seen below. The interior of the Holy Face chapel is a small cave-like chamber. A few burning candles light up the darkness. In contradiction to the busy street outside, this chapel is a safe haven of tranquility. A closer detail of the simple stone altar is seen below. 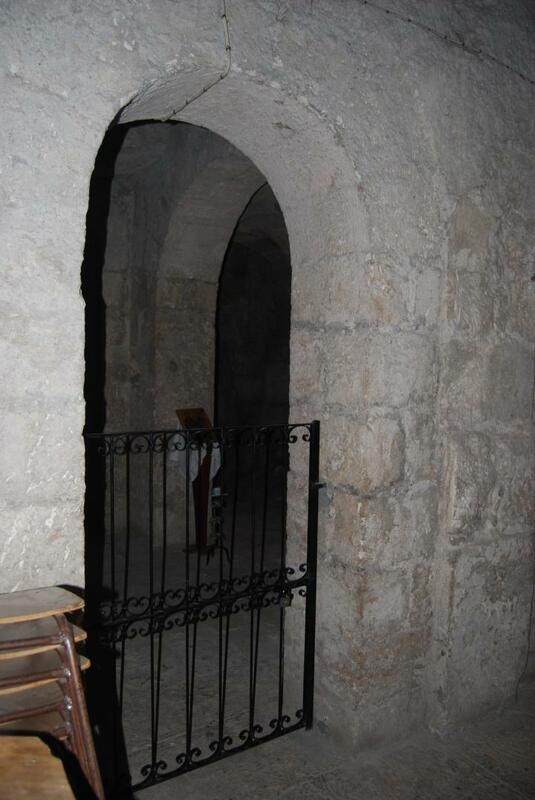 On a lower level, hiding in pitch darkness, are chambers of the crypt. 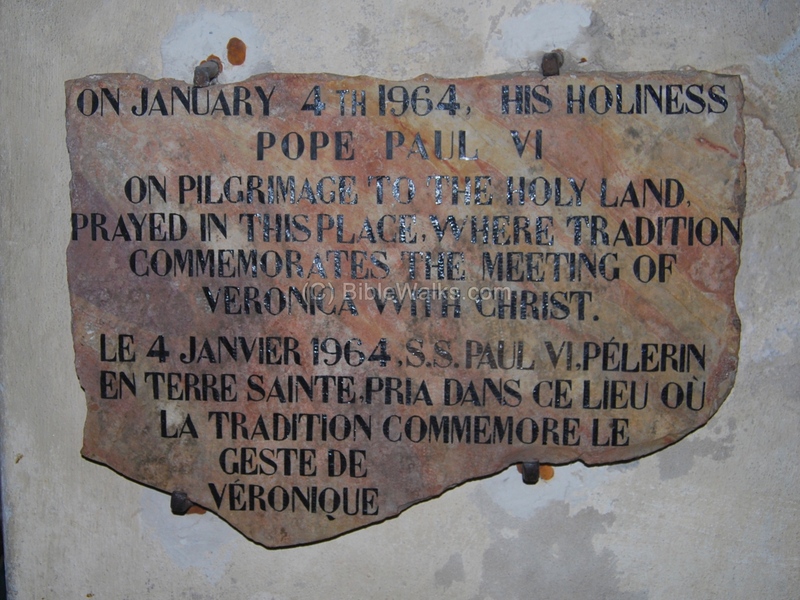 A stone plate commemorates the visit of Pope Paul VI in 1964 (VI visits the VI...). The 7th station, according to the tradition, marks the place where Jesus passed through the Gate of Judgment, along the streets of Jerusalem. 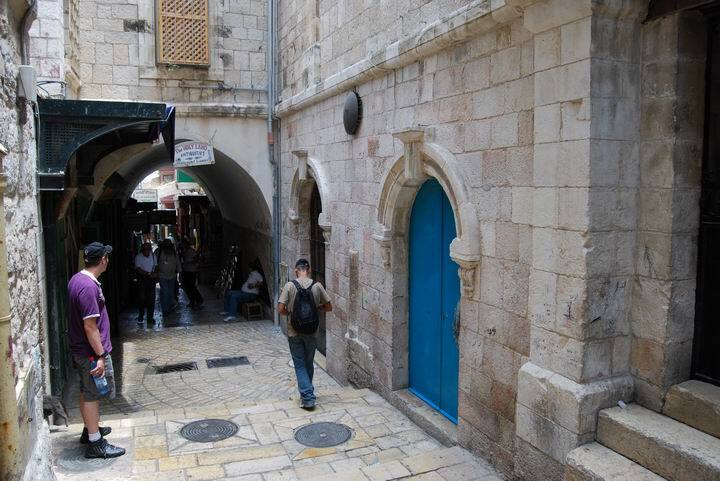 This street in one of the busiest in the old city, as it may have been during Jesus times. 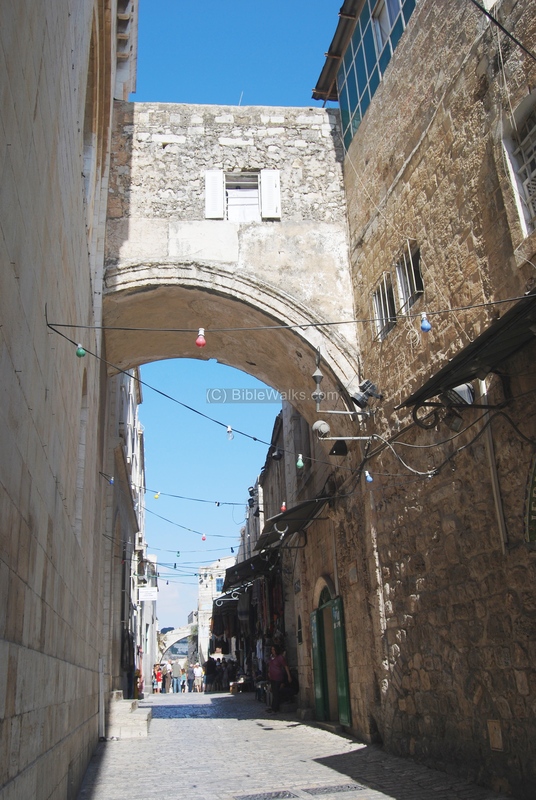 It was an intersection of the Cardo Maximus and a transverse street of the Roman Aelia-Capitolina, and in modern days an intersection of Via Dolorosa with Khan es-Zeit (the Oil Market). The way up hill and the pressure of the city had its toll: Jesus falls here for the second time under the weight of the cross. Behind the doors is a small chapel, with stairs leading to the second level (which is closed to the public). The Franciscans took possession of the chapel in 1875. 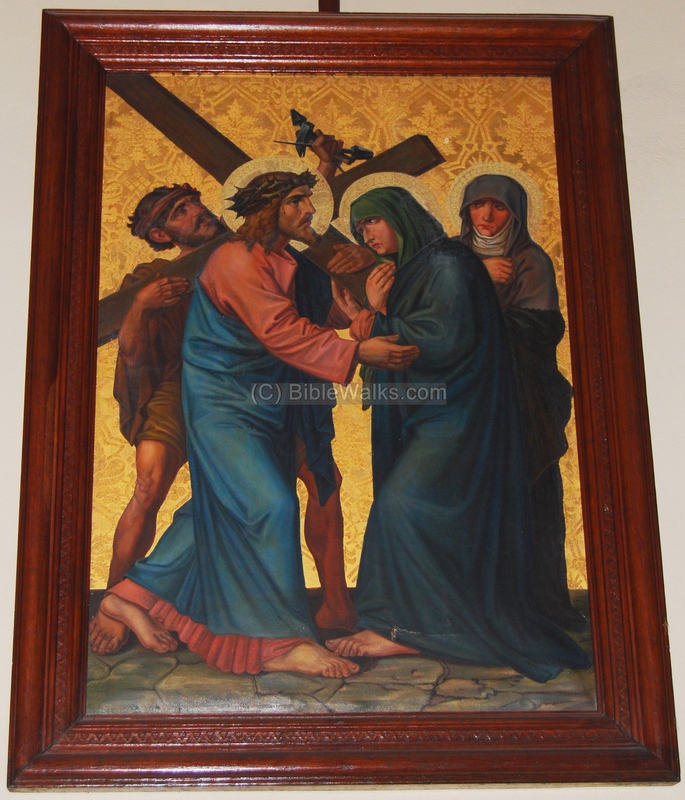 The framed picture shows the scene of Jesus falling under the weight of the cross. 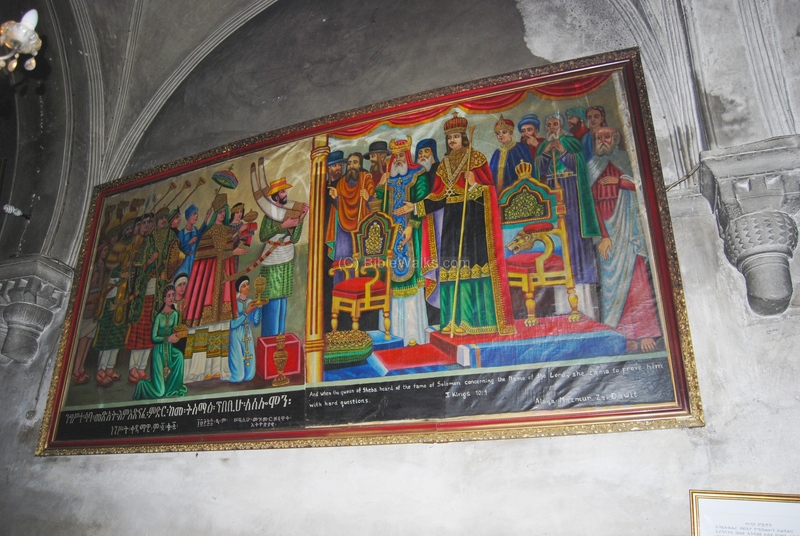 Under this altar is a wall painting, seen below. 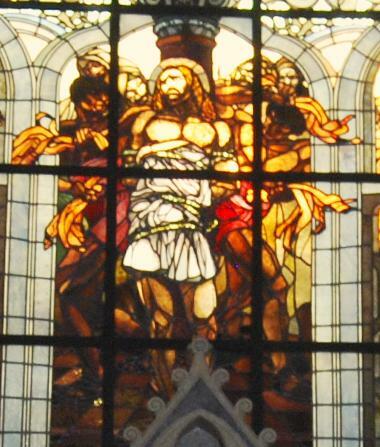 It also shows the scene of Jesus falling under the weight of the cross. 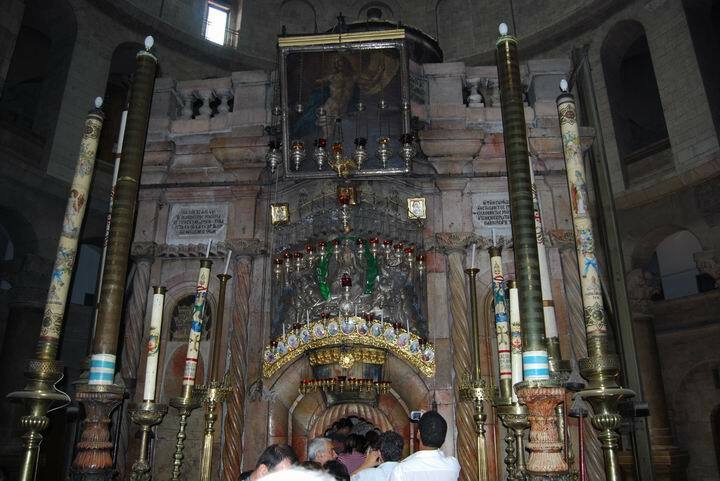 On the left of the fallen Jesus is a Roman column, which was found in this site. 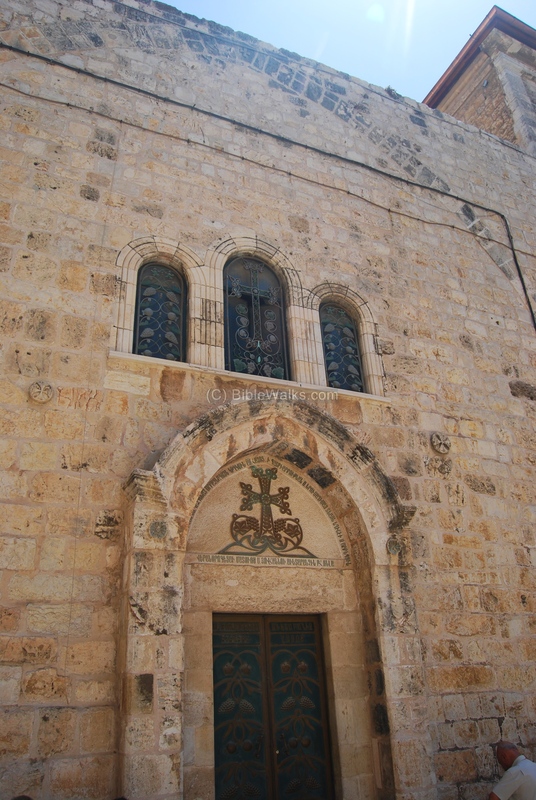 The second chapel is located on the right side of the entrance, with three steps that lead down to its hall. A 2nd C Roman column, whose base is seen in the center of the photo below, blocks part of the passage. The column above its base is made of red stone. Passed the Roman column is the chapel of the seventh station. 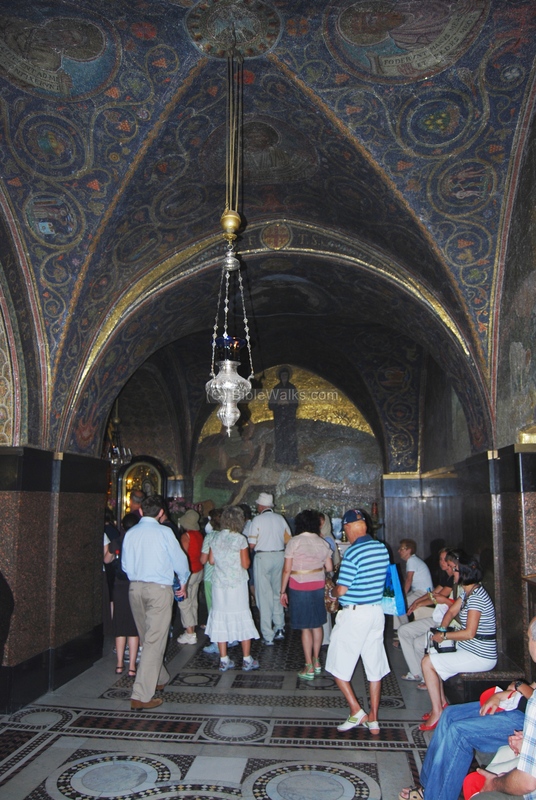 A golden statue of Jesus, falling under the weight of the cross, hangs on the center wall. The seventh station is located on a junction of the busy streets in the center of the old city of Jerusalem. 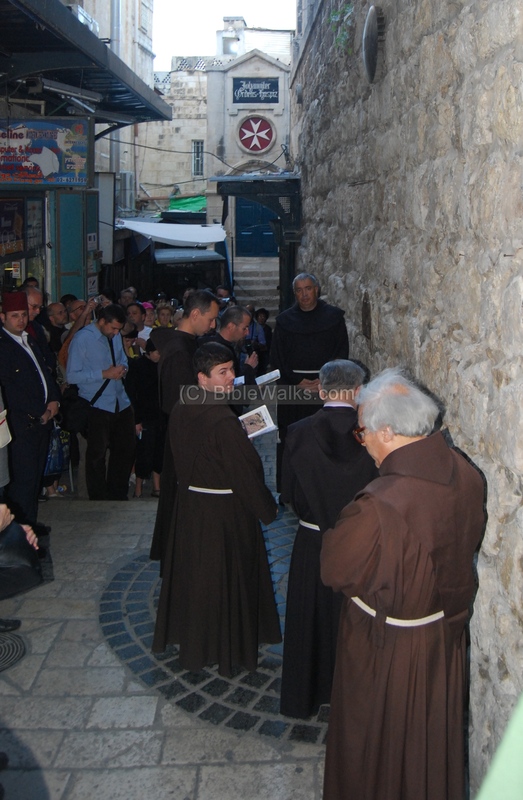 The Via Dolorosa procession takes place every Friday at 3pm , starting from Station 1, and is led by the Franciscans. It is recommended to follow them along the route. 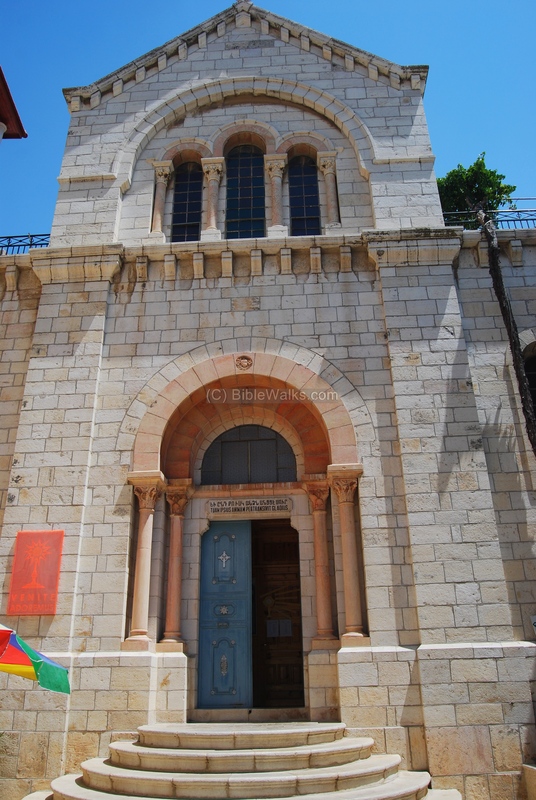 Station 8 is located closest to the Church of the Holy Sepulchre, and is dedicated by the Greek Orthodox to Saint Charalampos; their monastery is located behind the wall. The station is based on Luke 23, 27: "But Jesus turning unto them said, Daughters of Jerusalem, weep not for me, but weep for yourselves, and for your children". A stone with a monogram, embedded into the wall, marks the station ("IC-XC NI-KA", means: Jesus Christ conquers). The Via Dolorosa procession on Friday afternoon is seen in the photo below stopping at station 8. A German hospice (with the sign of the red star) is located near the station, and is seen in the background. 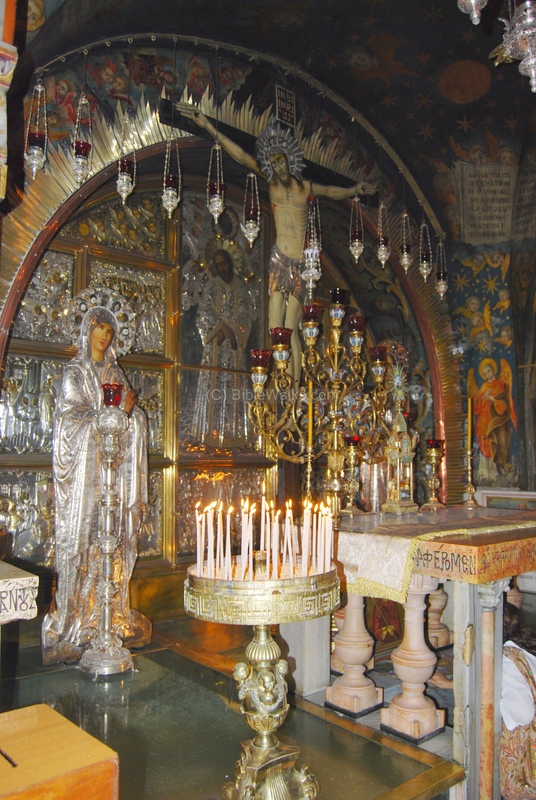 Further up the hill and close to the place of crucifixion, Golgotha, Jesus falls the 3rd time. The 9th station is adjacent to the Holy Sepulcher - the tomb of Jesus. On the way to the station the road winds around the Coptic patriarchate building, through a narrow alley. 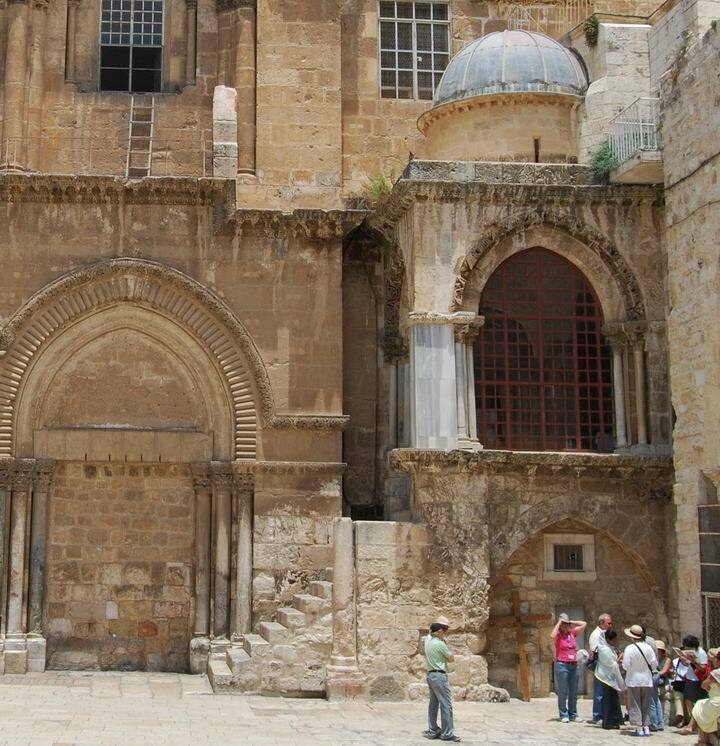 The photo below shows the east side of the Holy Sepulcher at Golgotha, which is seen in the far background. Pilgrims that follow the path of Via dolorosa are seen below, reading verses and singing while holding a wooden cross. 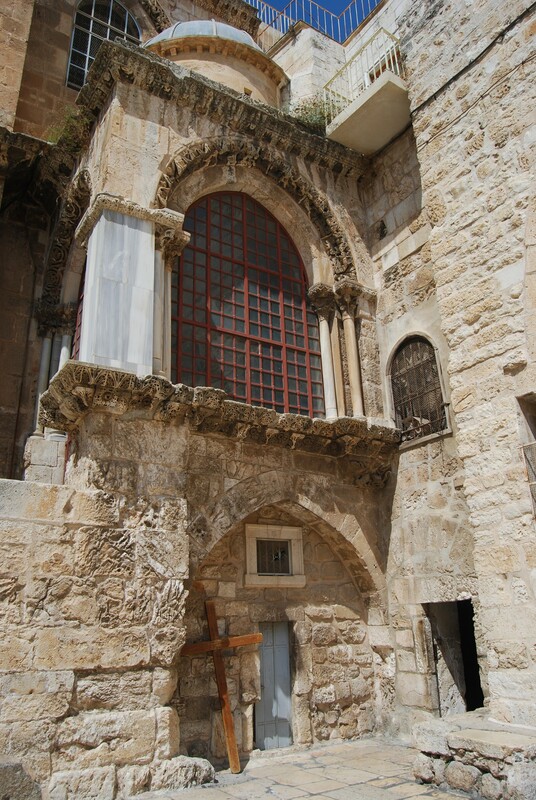 The alley leads to the station, which is located on the north-eastern wall of the Holy Sepulcher. 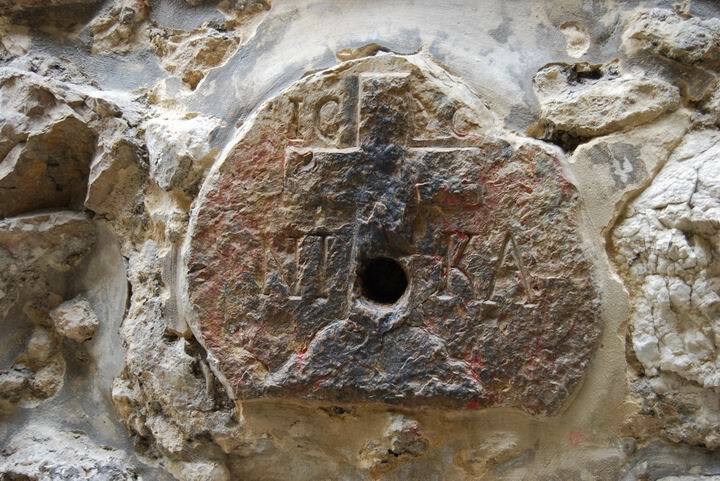 The station is marked by a cross on a pillar, which is seen below, located on the wall of the Coptic Patriarchate. 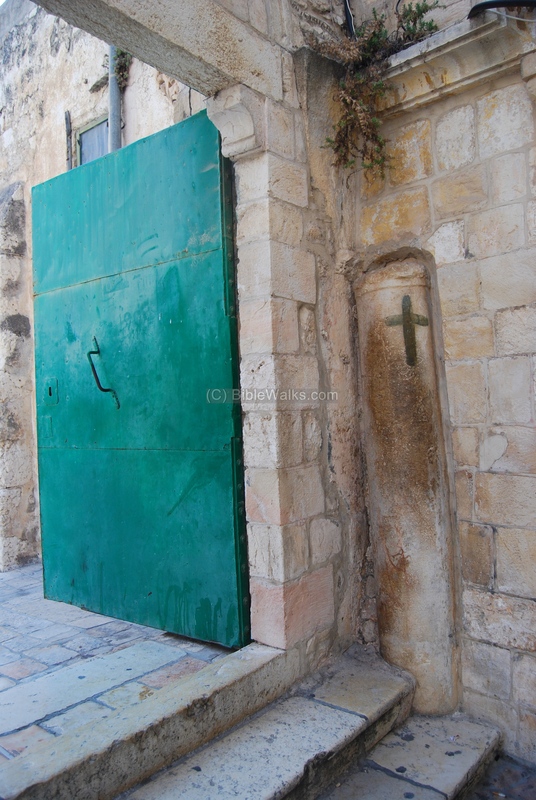 The green door on the left leads to the yard of the Holy Sepulcher. 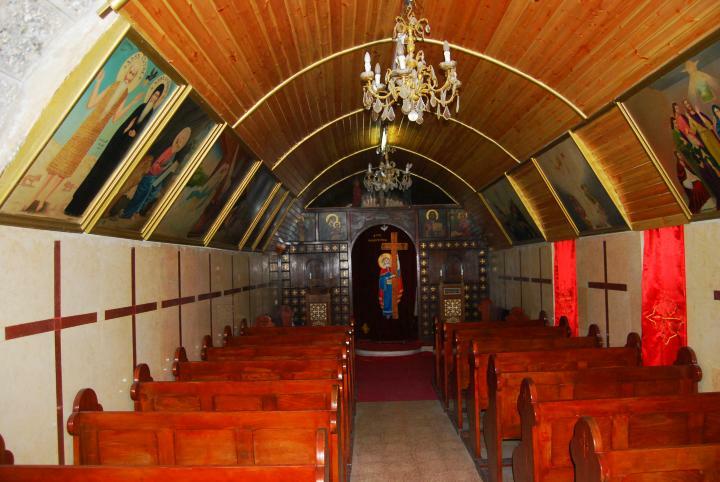 Near station 9 is a small Coptic Orthodox church of St. Helen. 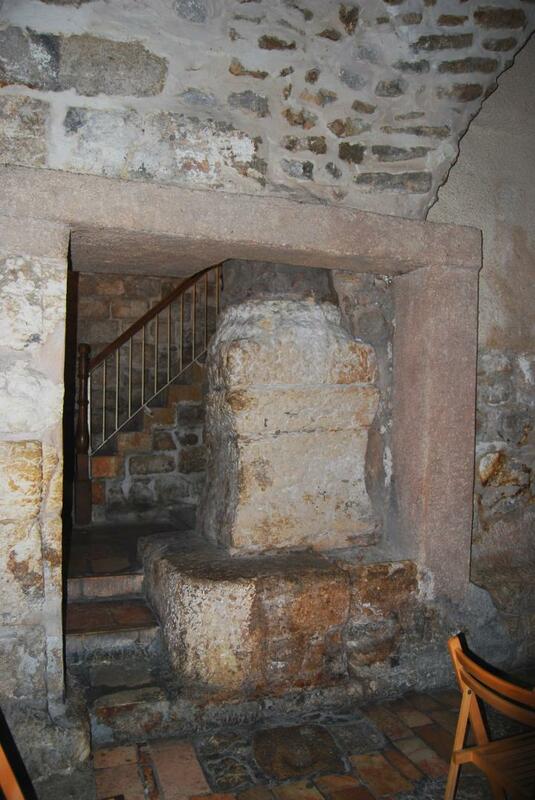 Inside the church of St. Helen is a large underground water cistern that is accessed by a staircase. According to the Coptic church it was discovered in the 4th C by Constantine's mother Helen, and provides water to the Church of Holy sepulcher. Don't miss this enchanting cool site, but walk down carefully. 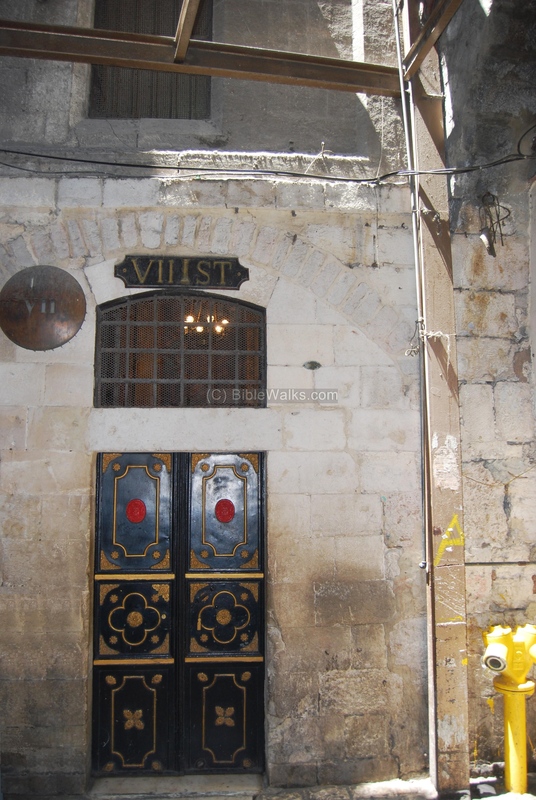 Around the 9th station are other several interesting sites, located behind the Holy Sepulcher. 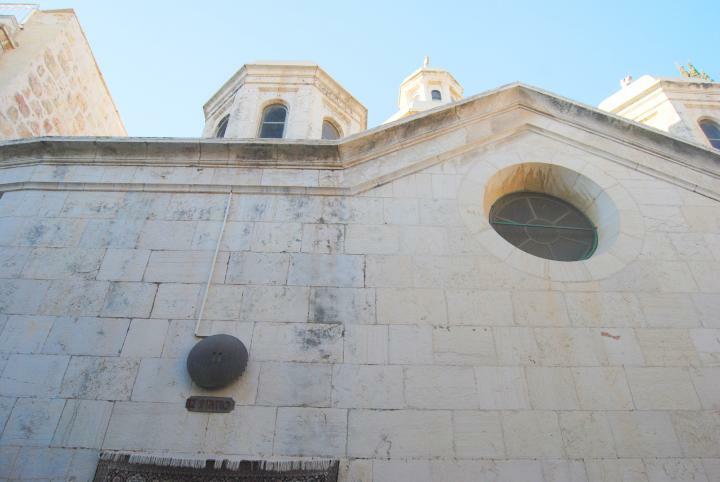 The cupola seen on the right is the top of the underground Armenian Chapel of St Helen. On the left side of this roof courtyard is the entrance to the Ethiopian church of St. Michael. On the far (hidden) left are quarters of the Ethiopian monks. 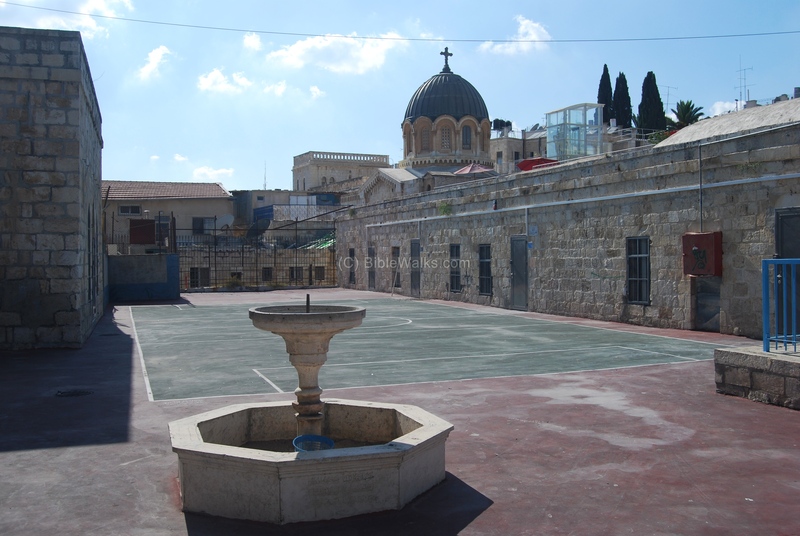 A Coptic church is located near this courtyard. It can be entered by a staircase from the courtyard. On the right wall of this small church is a painting of a Biblical scene (1 Kings 10:1) - King Solomon receiving the Queen of Sheba. This church can also be entered from the Holy Sepulcher's front yard. The entrance of the church is seen below, located on the right side of the Holy Sepulcher. 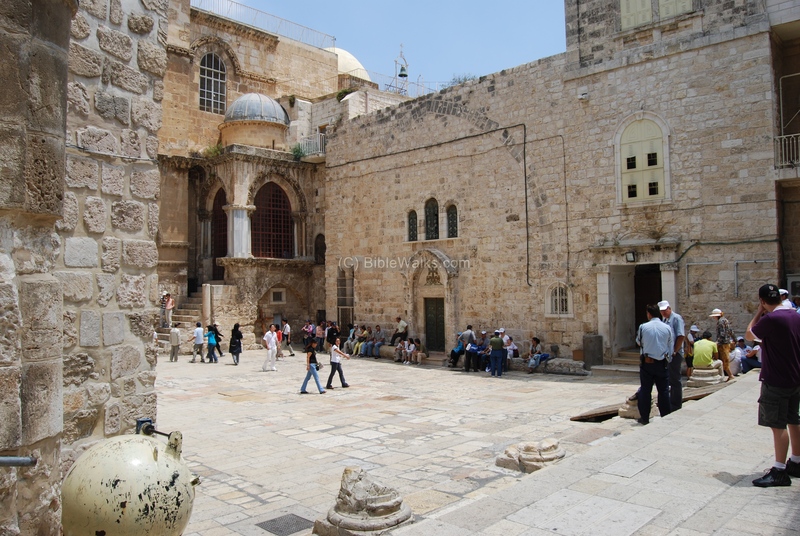 The front yard of the Holy Sepulcher is seen below, with the Coptic church in the center, the Ethiopian chapel on its left side, and the Chapel of the Franks (the location of the next station) on the far left. At this station Jesus was stripped off his clothes, as in Mark 15,24: "And when they had crucified him, they parted his garments, casting lots upon them, what every man should take". 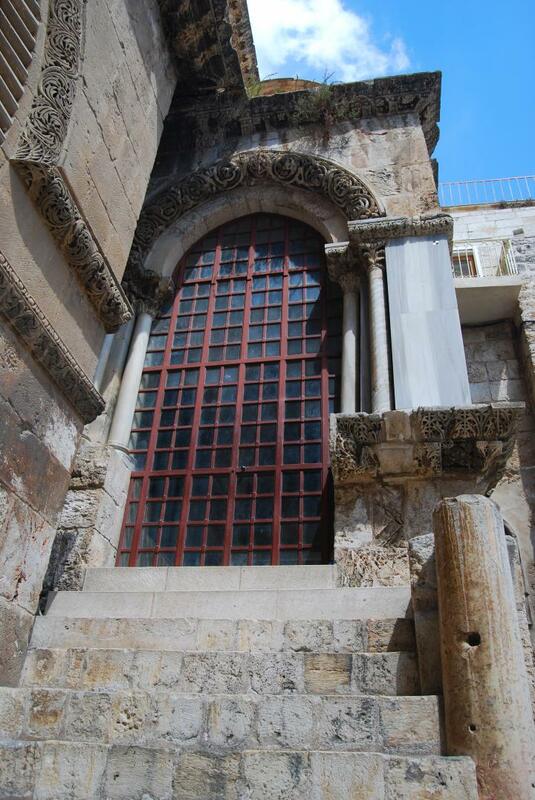 Station 10 is located at the entrance of the Church of the Holy Sepulchre, in the room called the Chapel of the Franks. It is seen in the photo below on the right side, with stairs that lead to the small chapel. A closer view of the Chapel of the Franks at Station 10 is seen below. The interior of the small chapel is seen below. 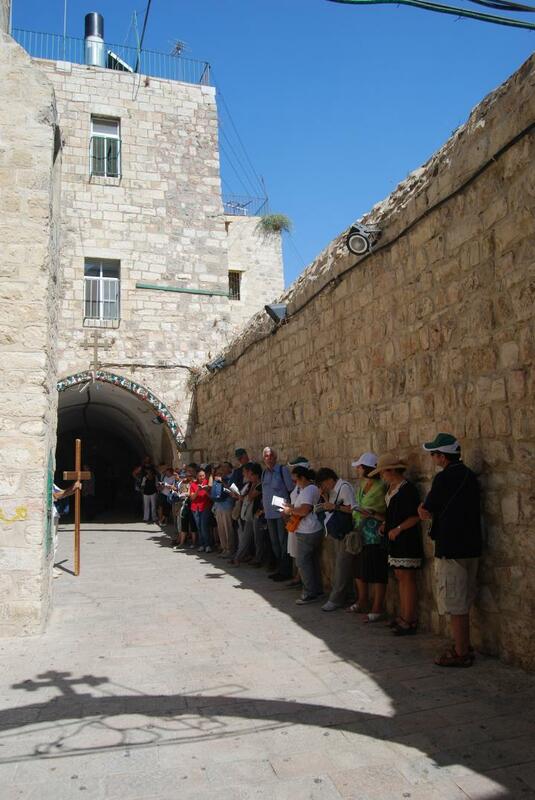 The wall on its left side is the location of station 11 inside the Holy Sepulcher. 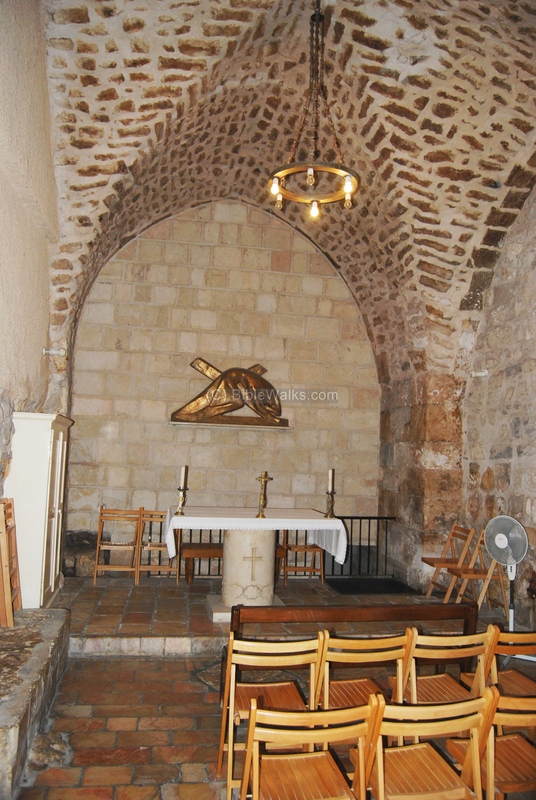 Under the chapel is a Greek-Orthodox chapel named of St. Mary of Egypt, a 5th C hermit who is the patron saint of penitents for the Greek Orthodox. Its door is seen on the ground level directly under the Chapel of the Franks. On the right side is the entrance to the Ethiopian chapel. Reaching the place of crucifixion, the hill called Golgotha, Jesus is nailed to the cross. This station is located inside the Church of the Holy Sepulchre, just behind the wall of the 10th station. 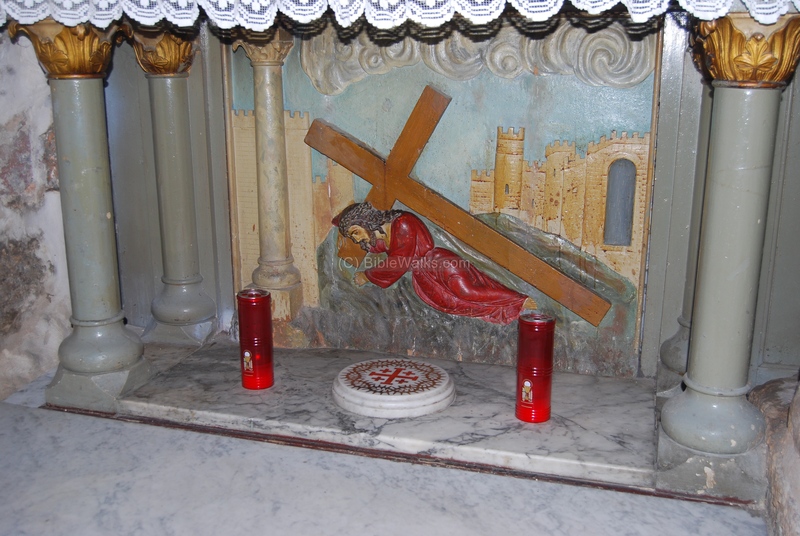 This is the Latin (Franciscan) altar on Calvary (place of the skull - Golgotha). Jesus is crucified and dies on the cross, ending His agony. The location of this station, 12, is a Greek Orthodox crucifixion altar which is inside the Church of Holy Sepulcher. A silver disk with a central hole, underneath the altar, marks the spot where the Cross stood, and pilgrims kneel and kiss the spot, as seen below. The silver icons of Virgin Mary and St John are on Jesus side. 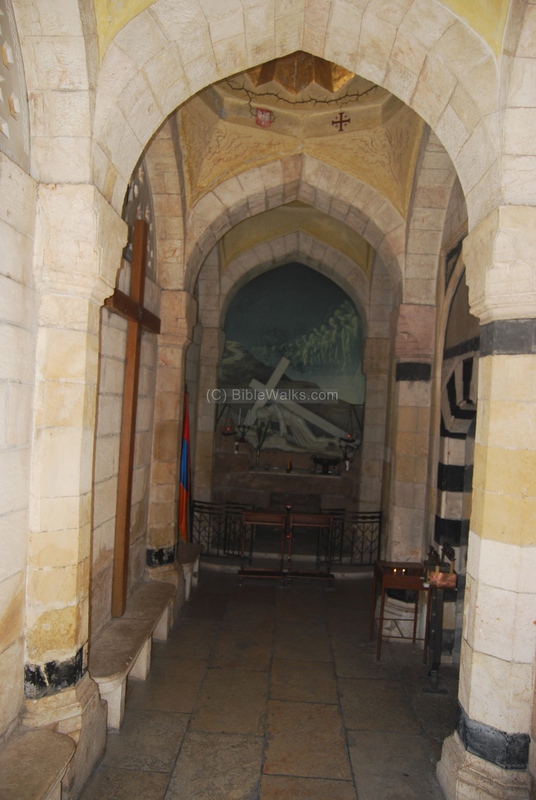 This station is also located inside the Church of the Holy Sepulchre. According to tradition, the body of Jesus was laid on this stone after removed from the cross. As per John 19: 40: "Then took they the body of Jesus, and wound it in linen clothes with the spices, as the manner of the Jews is to bury". In the photo below - the stone of anointing (unction) greets the visitors, who kneel, pray and kiss the stone. Above the stone are lamps, each donated by one of the denominations. 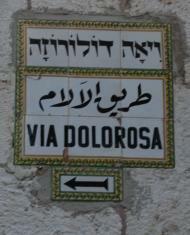 This is the final station of Via Dolorosa, located in round hall ("Rotunda"). 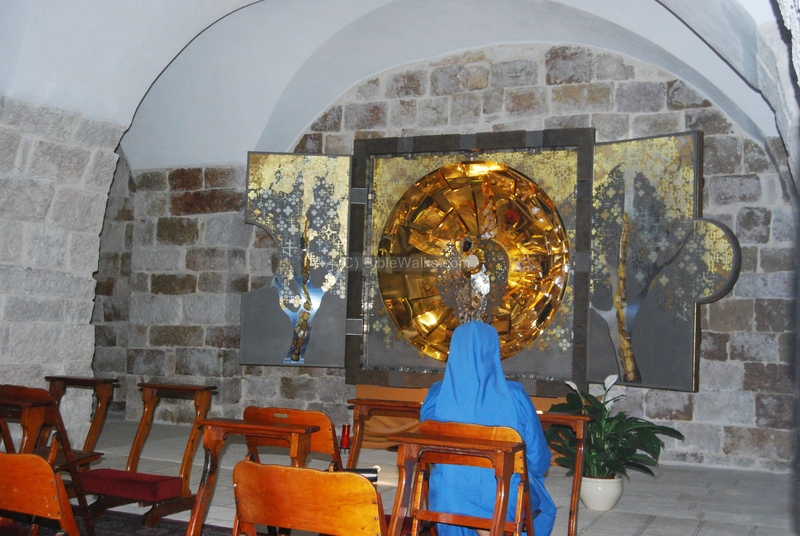 The tomb of Jesus is located in a smaller structure in the center of the circle. The first chamber is called the Chapel of the Angel. Behind the Chapel is another narrow door which leads to a smaller inner chamber - the tomb of Jesus. 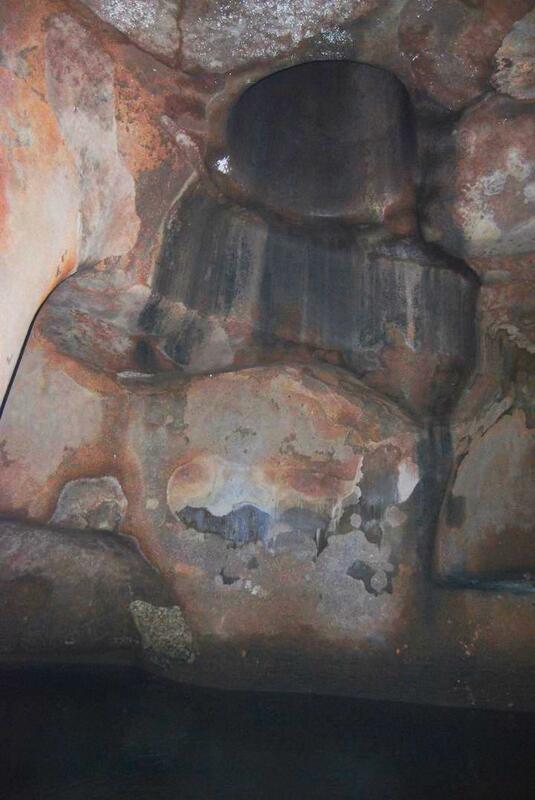 Parts of the tomb's interior is seen below. A marble lid covers the tomb. Thus ends the journey of the "way of the Grief". It ended here, but a new journey sparked from this end , starting a new faith which changed the World. 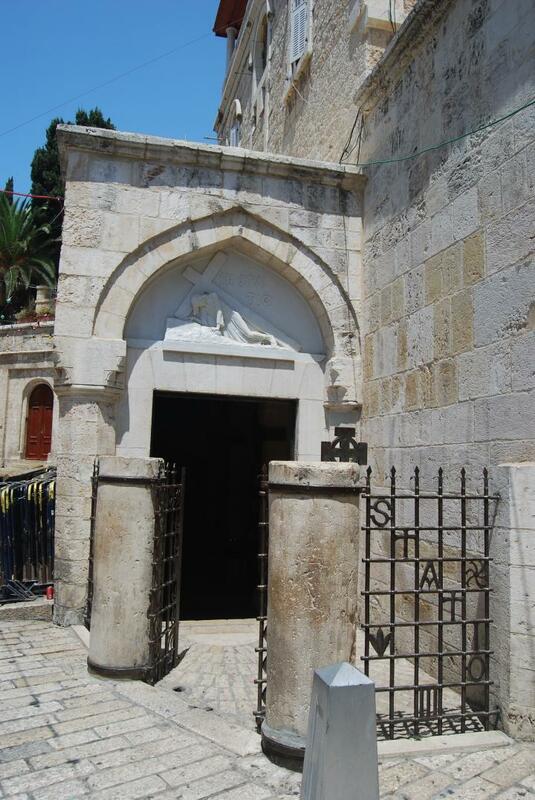 Via Dolorosa - Latin for the "Way of Grief"
Sepulchre/Sepulcher - burial vault. From Latin: Sepulchrum. Based on sepultus - to bury the dead. Golgotha - In Aramic , based on the Hebrew word: Golgoleth which is "skull". 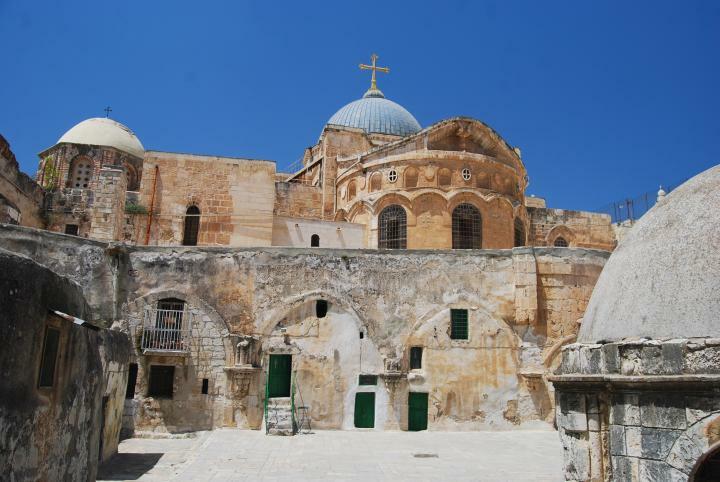 Refers to a hill where the burial site of Jesus - the Church of Holy Sepulchre, in the Christian sector of the old city of Jerusalem. As in Matthew 27:33: "And when they were come unto a place called Golgotha, that is to say, a place of a skull". The meaning of the name may be either due to the practice of burying the skull. It can also refer to a rock that looks like a skull. Calvary (Calvariae) - from Roman: place of skull. The name of the hill where Jesus was crucified and buried. Luke 23:33: "And when they were come to the place, which is called Calvary, there they crucified him..."
Check out our new pictorial presentation of the footsteps of Jesus. You can also download the Jesus Footsteps screensaver.